Contributing more power to the grid than it consumes, the 700 square-foot BrightBuilt Barn in coastal Rockport, Maine, maintains comfortable indoor temperatures without the use of fossil fuel. Photo courtesy Bensonwood Homes Building a net-zero energy house is one thing in a mild climate, but what about a tough environment like the coast of Maine? In coastal Rockport, Maine, and the nearby town of Unity, some architects and builders are showing that it can be done — and with style. 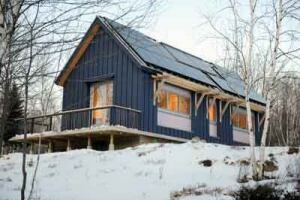 The “BrightBuilt Barn” in Rockport, in fact, isn’t just a net-zero-energy home. The 700-sqft structure actually is designed to produce more energy than it uses on an annual basis. The goal is to erase, over time, the building’s original “carbon debt” — to produce more energy, from clean sources, than was consumed by creating it. Kaplan Thompson Architects, of Portland, Maine, anchored the project team; Bensonwood Homes, of Walpole, New Hampshire, fabricated much of the building off site. Site construction was managed by Rockport’s Gibson Design/Build. The air-tight structure has R-40 walls, roof, and floor, with triple-glazed fiberglass windows. Translucent, insulating sheet polycarbonate walls allow extensive daylighting of the space; artificial lighting is supplied by low-wattage LED lights. An official press kit for the project provides details about the building’s mechanical and power systems, which meet the house’s stripped-down energy demand using mostly sustainable sources. Evacuated-tube water heating panels supply hot water and some supplemental heat; a grid-tied photovoltaic system on the roof produces more energy in most 24-hour periods than the building will consume (although the house does draw from the grid at night). 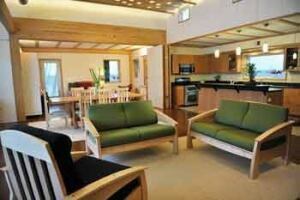 There is no furnace — body warmth and appliance heat keep the living area warm most of the time. An air-to-air heat exchanger provides fresh air ventilation, while recapturing the heat from the exhaust air stream. The BrightBuilt Barn, however, is just a 700-sqft cabin. While the design can be adapted for use as a 2-bedroom house, the Rockport prototype is currently used as an artist’s studio. So can the concept be extended to a full-size family home? Tedd Benson, Bensonwood’s founder, says yes — and he’s doing it with a new portfolio of designs called Unity. The Manchester, New Hampshire, Union Leader has this report (“Finally, a home that gives more than it takes,” by Melanie Plenda). Besides being a showcase of energy-efficient, sustainable construction, the Unity houses also implement Bensonwood’s trademarked ” OpenBuilt” design and construction concept.